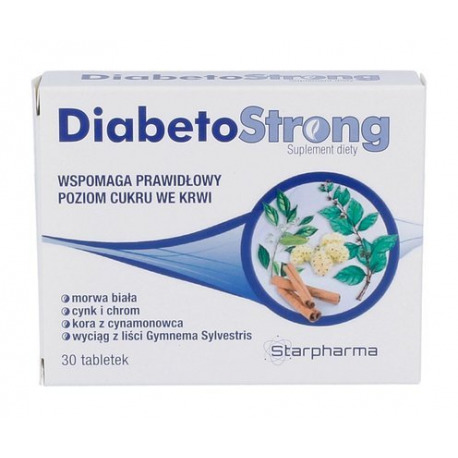 Return to Home > Pro-Gezondheid>STARPHARMA - DiabetoStrong - 30 tab. It helps to maintain correct blood sugar level. Regenerates functioning of pancreas, reduces cholesterol and free fatty acids levels. 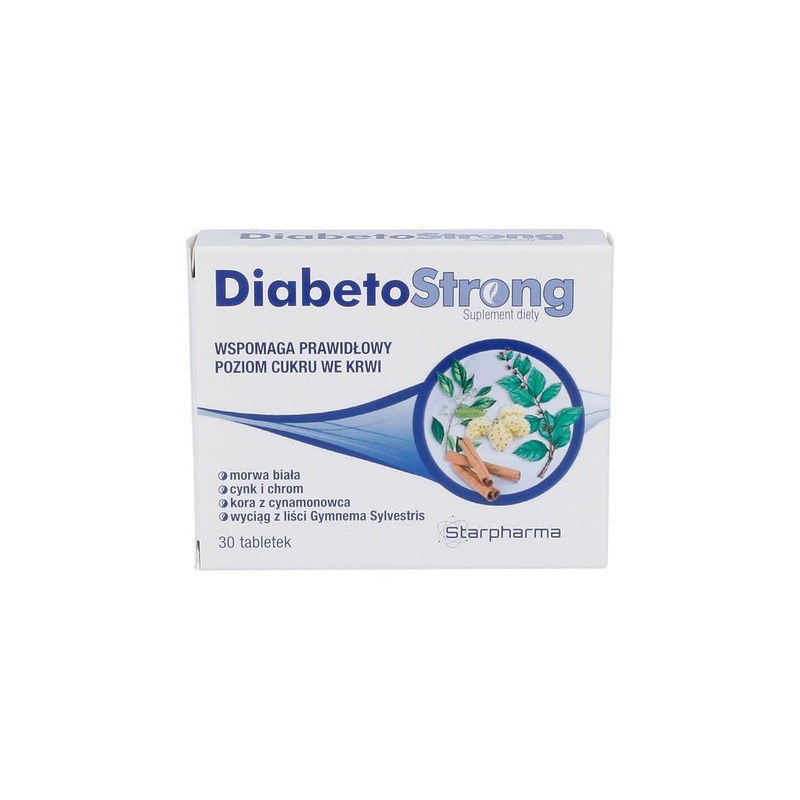 Active elements of DiabetoStrong dietary supplement help to maintain correct blood sugar level in the body. Morus alba leaves extract stabilises the blood sugar level, reducing its absorption in the organism which also affects slimming process. Gymnema sylvestris has diuretic effect and reduces the craving for monosaccharides. It regenerates functioning of pancreas what affects correct production of insulin in the body. It reduces cholesterol and free fatty acids levels. Zinc helps to maintain the acidic and alkaline balance and carbohydrates metabolism. Chromium maintains correct blood glucose level. Morus alba stabilises blood sugar level reducing its absorption in the organism. It slows oxidative stress and restores the functioning of blood vessels. It reduces atherosclerosis and cardiovascular disorders. Gymnema sylvestris increases blood insulin level and activates glucose metabolism, also in cases of diabetes. It boots the synthesis of liver and muscle glycogen. It reduces glucose and fatty acids absorption from the gastrointestinal tract. Zinc maintains the acidic and alkaline balance and fatty acids balance. It takes part in proteins, carbohydrates and fats metabolism. Zinc is essential in proteins synthesis; it is also an important ingredient of digestive enzymes, takes part in insulin storage and reinforces the immunological system. Chromium maintains correct metabolism and blood glucose level, decreases appetite and helps slimming processes. It regulates sugars, and fats transformation in the body. 1-2 pills a day (preferably 1 pill 2 times a day), directly before meal, washed down with water. It is recommended not to exceed the daily dose (2 pills a day). Dietary supplements should not be used as a substitute for a balanced and varied diet. The product is not suitable for pregnant and breast-feeding women and for children.